When businesses and industrial units contact the 1st Choice team for an assessment of their current security set up, we will always include discussion of car-parking facilities as these can easily be forgotten. Of course the priority when securing assets and property will always be the entry systems to the buildings, but visitors, potential clients and employees also need to feel that their vehicles are secure on the premises. Automatic parking barriers and bollards are a simple and effective solution for your car park; they add an extra layer of security and can be customised to suit your specific requirements. The most recent crime stats published for Essex show that violent crime has risen sharply when compared with last year’s figures. Anti-social behaviour (including trespass, graffiti, and vandalism) remains the largest reported crime but this has remained fairly constant over the past twelve months. Colchester has the highest reported crime rate in Essex and whilst local police insist that the city’s crime figures have improved over the past decade, they suggest that it is the responsibility of every citizen to be alert to the potential for crime, report suspicious activity and secure their property appropriately. 1st Choice Security Systems has a reputation for providing honest assessments and effective security solutions across Essex. 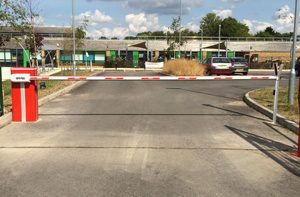 Over the past decade we have worked with retail developments, schools, factories, small businesses and residential estates on creating an effective external perimeter barrier system with which to secure car-parking facilities. Whilst we are always concerned to safeguard the vehicles, we are also aware that car-parks can create the conditions for violent attacks on employees who have, perhaps, worked late or find themselves the last to leave. Bollards or automatic parking barriers. Available as manual or automated systems. Designs and colours to suit your premises. Anti-crush hydraulic safety device fitted on all parking barriers. Hydraulic locks fitted on all devices. Our highly qualified installers can advise you on combination security solutions such as the inclusion of alarm systems or CCTV in order to ensure heightened security for employees and visitors at any time of the day or night. Our Installers have the experience and knowledge gained from training to be able to offer the required security solutions in Essex and elsewhere. Find out more about our security services in Essex.